While you wear these boots, you have a flying speed equal to your walking speed. 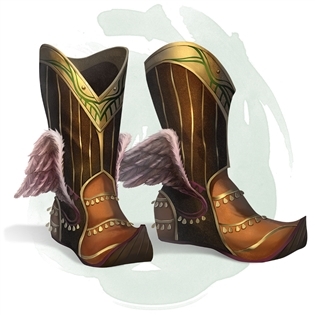 You can use the boots to fly for up to 4 hours, all at once or in several shorter flights, each one using a minimum of 1 minute from the duration. If you are flying when the duration expires, you descend at a rate of 30 feet per round until you land. The boots regain 2 hours of flying capability for every 12 hours they aren't in use.